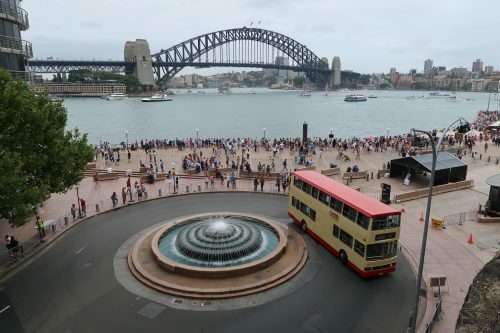 How is this for an unusual sight – a Kowloon Motor Bus double decker driving along the shores of Sydney Harbour! The story of how this bus, along with two more from Hong Kong, ended up in Australia is thanks to the efforts of bus enthusiasts. Who are bus fans anyway? Hong Kong is full of bus enthusiasts. Mr. Chan, an accountant, is one of Hong Kong’s thousands of bus fans, ranging from young students to retirees, who are enthralled by the city’s some 6,000 buses. They linger by bus depots and lurk near highway ramps, angling for the best shots. They form fan clubs, eagerly swap the latest gossip about changes in bus models and film their own rides, which they share online with anyone who wants to follow along (spoiler alert: they aren’t always scintillating). Older non-air conditioned buses are a particular a favourite. They may be hot, noisy and rough to ride on, but the rapidly vanishing non-air-conditioned bus is a Hong Kong icon that conjures nostalgic memories of a bygone era. That is why transport enthusiasts are urging the government to help preserve some of the historic rattletraps before they are gone from the city forever. With some enthusiasts have even gone so far to purchase their own retired bus. When it comes to pastimes, Hongkongers run to the usual suspects: karaoke, video games, television and football. They also have their share of unusual ones. Tony Ng Cheuk-ho, 20, falls into the second category. Every weekend, his hobby takes him to a Tin Shui Wai car park and a rendezvous with his pride and joy: a big yellow double-decker bus. He washes it, drives it and admires it. ‘The bus has its own life,’ Ng says. ‘Sometimes it’s grumpy. Sometimes when I drive it to the other side to wash it, it’s very happy and moves smoothly.’ Whatever its ‘mood’, he treats his bus as a friend. His interest may sound weird, but he’s not alone. There are about 15 private bus owners in Hong Kong, according to 22-year-old salesman Eddie Wong King-him, who owns an ex-China Motor Bus. So how did the buses end up in Australia? The first ex-Hong Kong buses to arrive in Australia were imported for use on open top tourist services, but the plan fell through, with a local bus enthusiast snapping one up. After ML1 (CM8935) retired from NWFB, it was purchased by City Sightseeing with ML2 and dozens of other MLs, and was shipped to Australia as part of the local tour bus fleet. The company originally arranged ML1 to travel on the Gold Coast and Brisbane tour bus routes, but the plan was eventually cancelled. In 2005, Australian bus fans with BL66 and ME30 purchased ML1 from CitySightseeing and repaired it on a large scale. Fortunately, the company did not replace the engine, open the top, and refit the stairs, and the original CMB seats and high-quality paintwork removed from the ML2 made the entire bus a new look. It was also very similar to the original bus. Proximity is a very high quality repair. The “new car” was carefully cared for by the owners and joined with the former KMB BL66, also from Hong Kong, to participate in many local activities in Australia and attract the attention of many passers-by. A second bus was purchased in Hong Kong from the scrap yard by an Australian bus fan. After being retired, the BL66 was purchased at the scrap yard. The current owner purchased the container in time and was initially parked at the Shangcun scrap yard and then moved to a parking lot in Hangwei Village, Tin Shui Wai for many years. Since the owner is an Australian bus fan and does not live in Hong Kong for a long time, the ME30 purchased with the owner of the car can only wait for the owner to get to Hong Kong to get a chance to go out. After waiting about seven years in Hong Kong, the owner finally returned the two vehicles to Australia in March 2009 and repaired the two vehicles. Along with a third bus. Just completed the BL66 article, it is better to take the opportunity to complete the ME30 story purchased by the same owner. ME30 joined KMB in September 1985 and retired in November 2002. After being parked and waiting at various locations in Hong Kong for a period of seven years, the ME30 and BL66 finally started their new page in March 2009 – transported by container ship to Australia. The owner repaired the ME30, successfully issued the license, and participated in local activities in Australia. One Australian group dedicated to the preservation of buses is the Bus & Coach Preservation Society of NSW, with members taking their historic buses out on the road for special events. They draw the attention of crowds, as well as people back in Hong Kong, with newspaper Apple Daily running this piece in 2015 on their outing. A retired KMB double-decker bus, preserved in Australia, attended local public events and the photographs were circulated on the Internet. Hong Kong people appreciate photos Aftertaste This bus, known as the “Car Emperor,” was a sigh in Hong Kong on the roads of Hong Kong. It was a sigh for Hong Kong to lose these historical artifacts. The trio of ex-Hong Kong buses ready to run the 2018 Australia Day vintage bus service. Bus ME30 alongside a similar vintage Sydney double decker bus. Buses ME30 and ML1 out in the Australian countryside. The trio of buses in the sheds at the Sydney Bus Museum. Bus ME30 beside Sydney Harbour. Bus ME30 departs the Sydney Opera House. ML1 is passed by a modern Sydney double decker bus. Here we see KMB bus BL66 being loaded onto a ro-ro cargo ship bound for Australia. And KMB bus ME30 being parked aboard the ship. And finally, the trio of ex-Hong Kong buses in action in Sydney. In early 2008 another Hong Kong double decker bus paid a visit to Australia – this time brand new Dennis Enviro500 as a demonstrator – New World First Bus #5504. New World First Bus ordered 18 Enviro500 buses with Euro IV engine in early 2007. 17 buses entered service in early/mid-2008, another one (fleet number 5504) was shipped to Australia in March 2008, after body assembly, for demonstration in several cities between April and May 2008, it finally entered service in June 2008. Here it is crossing over the Sydney Harbour Bridge. And passing the preserved China Motor Bus ML1. This entry was posted in Transport and tagged Australia, buses, heritage, Hong Kong, museums, preservation, Sydney. Bookmark the permalink. While I lived in Hong Kong from 1981 to 1985 I was a bus enthusiast. I used to sit at the side of the road spotting all the buses from both CMB and KMB. In all the time I was out there I never met another bus enthusiast. To read that there are now thousands of bus enthusiasts in Hong Kong makes me wonder where they all where in the 1980’s! I’ve got a few books about Hong Kong buses at home, and the authors had no trouble finding bus photos from that period – so presumably there were bus enthusiasts around back then, just lower key?